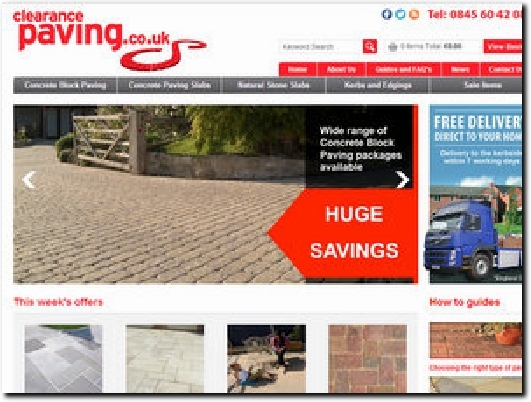 Clearance Paving are specialists in a wide range of discounted paving, sourced from a range of manufacturers for discontinued, trial or specially available products that are perfect for customers looking for a great deal. This allows us to provide garden paving slabs and blocks at a fraction of the price you would pay elsewhere. Combining some of the cheapest prices around, easy online ordering and payment, quick direct delivery and responsive customer service, we are confident that you won"t find a better service anywhere else. We stock concrete block paving, concrete paving slabs, natural stone slabs and other landscaping materials that we deliver directly to you. Leicestershire-based supplier of paving products delivering to the UK mainland. Secure on-line payments taken. Contact Us page has full details including company registration and VAT numbers. Prices quoted include VAT. Useful guides on selecting, ordering and maintaining your paving. FAQs section covers delivery and returns etc.